My name is Sarah and I'm 12. 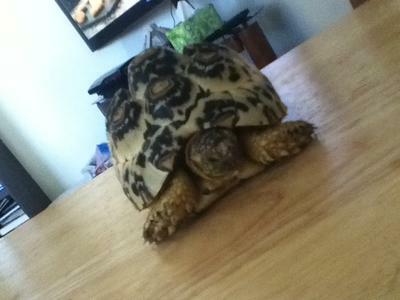 I have always wanted a tortoise when i was little and about 3 years ago i got one. She was (and still is) the cutest little critter ever! She also has an alphabetical shell (see in picture)! She's also VERY smart. She can play sports; i put mini jingle-bell balls in her cage and she "plays" that sport! Also, she knows that if she is ever about to fall from somewhere high up (which i hope NEVER happens) she knows to back away from that spot so she doesn't fall! And don't get me started with grass. Shelby LOVES grass! I usually leave her to eat some grass in my backyard and when i pick her up to go back inside, she looks like a little crazy person. If she could speak, she would say "MOMMY, MORE GRASS! I LOVE GRASS!" I also love it when shes dresses up. I bought her a cute little Halloween costume (shown in picture)! And for Christmas last year, Santa made her a little hat (sorry no pic for that one). My aunt has a mini figure of a wolf, right. So i put Shelby in front of it and she thought it was food! 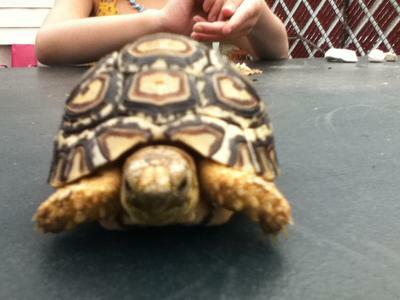 Silly little tortoise! I also love to call her nicknames; Shelbydoodle, Sugarpie, Sweetie, Honeybun, Cutiepatootie, Shelby baby, and many more. And i know shes smiling on the inside :) I give Shelby as much care as I would to a human baby. Shelby is my everything and if i lost her, i would lose everything. I love Shelby and Shelby loves me too! Sarah you have created a great costume for your tortoise. She looks so cute in that costume. You are having a loving heart. I said so because god has created a few people like you. God bless you my child. thanks; funny thing its actually a bandana for dogs. i found the smallest size and it fit her perfectly. got it at Petco. that is so great that you love her so much! 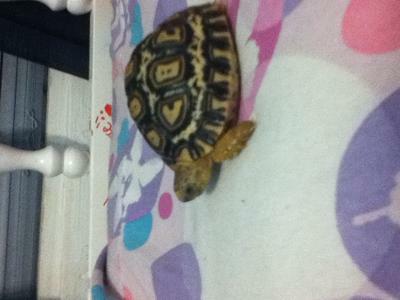 Shelby is one lucky tortoise.